It’s hard to imagine Ukrainian life without vareniki (or pierogi – the polish name). Some foreigners don’t understand why everybody in Ukraine are so obsessed with vareniki, cause according to them “they are just the dumpling-like pastry of unleavened dough with different stuffing”. But for Ukrainians vareniki are magic dish, I would say that they represent the Ukrainian soul – seemed to be simple outside but very rich and deep inside. You can eat vareniki all day long – as the hot snacks (vareniki with potatoes, topped with fried salo bits – shkvarky and onions), as the main course (vareniki with meat, cabbage, mushrooms, beans and liver), as the desert (vareniki with cherry, cottage cheese, jam and berries topped with honey and sour cream). 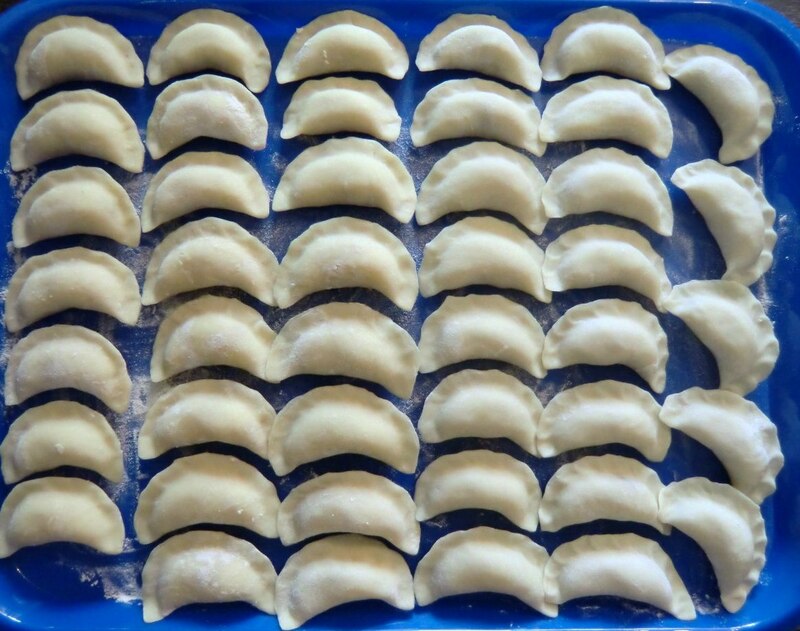 There are also lazy vareniki in Ukrainian cuisine – but not because of Ukrainian ladies are lazy, they are just simpler and don’t take a lot of time to cook. The shape of traditional Ukrainian varenik reminds a crescent. Ancient Ukrainians brought vareniki to the fields not only because they were nourishing food but also symbolized a good harvest. There were others symbolic meanings of vareniki in the Slavic ancient world. For example, bridesmaids always brought vareniki at the second wedding day as a symbol of wellness in family. Ancient Ukrainians thought that vareniki were almost the medicine – so they were given to pregnant women. Vareniki with cottage cheese were the “best weapon” against evil ghosts. 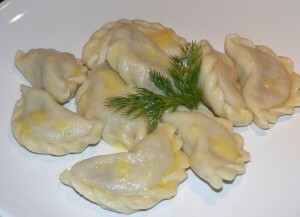 It’s interesting to know, that vareniki have the origin in Turkish cuisine. 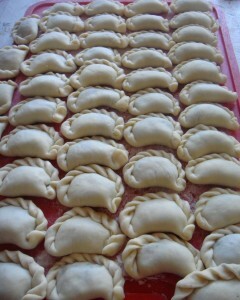 But Ukrainians created a lot of recipes of vareniki so nowadays it is 100 percent Ukrainian dish. 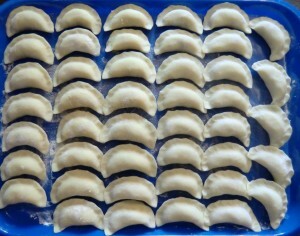 You may also know the traditional Russian dish – pelmeni (meat dumplings). The main difference between them are the size (pelmeni as usual are much smaller than vareniki) and also the staffing (pelmeni have meat stuffing and they can’t be sweet). Ancient Ukrainians ate vareniki on special occasions – weddings, birthdays, Pancake Day, Christmas and Easter. At the Christmas feast vareniki with different stuffing meant the union of generations. Guess where you can find the monument of vareniki? In the Canadian city Glendon, Alberta, where immigrants from Ukraine created the unusual monument of vareniki (pierogi). The big 9 metros stone varenik weights at about 2700 kilos. This huge love to vareniki proves the fact that Ukrainians are quite simple people who are hospitable, generous and like to share. Because nobody makes only one varenik! It always should be a huge plate of vareniki for every taste!